Ellora is a unique jewellery brand based in West London where each individual piece is designed and created. Components are sourced from all around the world. Gems from Jaipur, hand-worked gold filled metals (rolled gold) from Cape Coral and beautiful silver from the Hill Tribes in Northern Thailand. Small amounts of each design ensure exclusivity and as each piece is made by hand, no two pieces are exactly the same. I love to use organically shaped and textured pieces which adds to the uniqueness of the designs. Please add your item(s) to the basket, continue to checkout and complete the transaction via Paypal safely and securely. You do not need an account with Paypal - you can simply pay by most debit or credit cards. It is safe and secure. 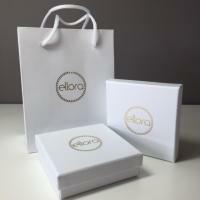 Alternatively, please email info@elloralondon.com to arrange payment by bank transfer. All items are presented in a gift box and bag and will be sent by Royal Mail Special Delivery or Signed For service. Each item is made to order, so please allow up to 5 days for delivery. If you are in a rush, please email first! Gold-filled metal - it is an actual layer of pure gold (minimum 14kt) bonded onto another metal. Not to be confused with gold-plated, it has literally 100 times more gold content than a plated piece. It wears similarly to pure gold, and if cared for properly, should not tarnish. It is also great for those sensitive to plated jewellery. Hill Tribe Silver - the various Hill Tribes live in the area known as the Golden Triangle, where Thailand, Laos and Burma (Myanmar) all come together. The silver used is soft and is up to 99.9 pure silver, not 92.5 as in the case of sterling. Their equipment is basic but such beautiful pieces are created by the skill of these tribes-people. As every piece is hand-made, there may be very slight differences between components. Personally, I think this is part of its charm and hope you will agree. Care of your Jewellery - please store your jewellery in the box or pouch it arrived in. Silver is prone to tarnishing when exposed to air/sunlight/perfumes etc. Rather than silver-dipping it in a harsh soloution (which is certainly not recommended on Hill Tribe pieces), it is best to wipe it with a soft jewellery cloth. Secondly, no jewellery likes being immersed in water or having perfume sprayed onto it - it can dull any metals, pearls and also weaken any stringing material used to make threaded pieces.